Porsche faces its second start in the top category, LMP1, of the famous 24 Hours of Le Mans since its return in 2014. On June 13/14 the race, which is known as the world’s toughest endurance event, takes place for the 83rd time. On Wednesday and Thursday the qualifying sessions will run until midnight on the 13,629 kilometre long circuit, which mostly consists of what are normally public roads. The three Porsche 919 Hybrids are the most innovative in the 56 car field and carry future technology for Porsche’s road going sports cars. The revolutionary technical regulations’ focus on efficiency for class 1 Le Mans prototypes (LMP1) attracted Porsche in 2014 to return to top level motorsport. The combination of a two-litre V4 turbo charged and petrol fuelled engine with two energy recovery systems (brake energy and exhaust energy) produces a power system of around 1000 HP. Because a high top speed of over 330 km/h is crucial on the ultrafast circuit in the West of France, the 919 has a special aerodynamic package for Le Mans. With this in place, the prototypes have less drag with reduced downforce at the crowning event of the FIA World Endurance Championship compared to the other seven six-hour races. The drivers of the three different coloured Porsche 919 Hybrids have between them participated in the Le Mans race a total of 43 times. The red number 17 car is driven by Timo Bernhard (Germany), Brendon Hartley (New Zealand) and Mark Webber (Australia). The black number 18 car is shared by Romain Dumas (France), Neel Jani (Switzerland) and Marc Lieb (Germany). The third Porsche, which is white, belongs to the trio of Earl Bamber (New Zealand), Nico Hülkenberg (Germany) and Nick Tandy (Great Britain). With 16 overall victories, Porsche is the record holder at Le Mans. The first overall victory for Porsche dates back to June 14, 1970 (Hans Herrmann/Richard Attwood in a 917 KH Coupé), and the last victory to date was on June 7, 1998 (Laurent Aiello/Allan McNish/Stéphane Ortelli in a Porsche GT1). According to the official ACO statistics, 770 Porsche cars have raced at Le Mans, and that too is a record. The fastest qualifying lap was driven by Hans-Joachim Stuck in 1985 in a Porsche 962 C (average speed 251.815 km/h). Since 1990 chicanes have been installed to break up the long Mulsanne straight. On the current track a lap time of under 3:14.843 minutes would be necessary to break Stuck’s record. In 2014 the two Porsche 919 Hybrids qualified second (Dumas, 3:22.146 mins) and fourth (Bernhard, 3:22.908 mins). The fastest overall lap time, during what have so far been 82 events, was done by Jackie Oliver at the test day in 1971. Back then the track length was 13.469 km and he did a 3:13.6 mins (average speed 250.457 km/h) in his Porsche 917. In the same year he achieved the fastest race lap in 3:18.4 mins (average speed 244.387 km/h). The current records on the 160 metre longer track are from 2010: In the race a Peugeot 908 managed a best lap time of 3:19.074 mins with an average speed of 246,463 km/h. The longest race distance was covered by Timo Bernhard/Romain Dumas/Mike Rockenfeller in 2010 in their overall victory for Audi, a total of 5,410.713 km (397 laps, average speed 225.228 km/h). In qualifying (Wednesday and Thursday until midnight), all 168 drivers from 29 different nations must run at least five laps in the dark. While WEC rules call for averaging the fastest laps of two drivers, the classic Le Mans method is to simply take the fastest lap driven with the car. The Le Mans night is one of the shortest of the year: the sun sets on Saturday at 9:59 pm, and it rises again on Sunday at 5:59 am. In normal racing mode (without any safety car periods), the Porsche 919 Hybrid must refuel every 13 laps. Refuelling and wheel changing may only be made sequentially, not at the same time. Only two mechanics may work simultaneously when wheel changing. That takes a lot longer than in Formula One, for example. Drivers are normally only changed when new tyres are needed. Two fuel tank fills with one set of Michelin tyres are the absolute minimum; three should be standard, at night it can be four. During the race, no driver may drive for more than four hours within a six-hour period. No driver may drive for more than 14 of the 24 hours. Due to the length of the circuit, there are three safety cars at Le Mans. The equipment taken to the track – in addition to the three race cars – includes a spare chassis, six engines, six front gearboxes, six rear gearboxes, nine front wings and nine rear wings, 80 rims, 120 radios and headsets. The amount of electrical energy that a driver can use for what is known as boosting is limited. 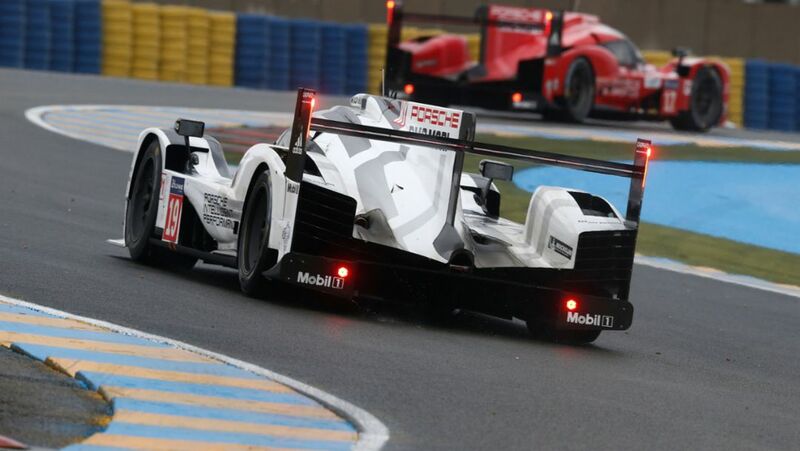 The Porsche 919 Hybrid may consume exactly 2,22 kilowatt hours (kWh) of electricity on each 13.629 km long lap. In 2014, the Le Mans victor completed 379 laps. Over this distance (5,165.391 km), the 919 Hybrid would generate and utilise 842.2 kilowatt hours (kWh) from its two energy recovery systems – an amount of electrical power that would be enough to run an average German household for three months. The Porsche 919 Hybrid has a power system that produces around 1,000 HP. Over 500 HP come from the two-litre V4 turbo petrol engine, while the e-machine, fed by the recovery systems, delivers more than 400 HP. The Porsche 919 Hybrid accelerates from 0-100 km/h within 2 seconds and takes 4.5 seconds from 0-200 km/h. At the fastest part of the Mulsanne straight the 919 reaches ca. 330 km/h. For the slowest part (Arnage) it has to slow down to ca. 70 km/h. Due to the aerodynamic downforce, and, therefore, the increased load on the wheels, the contact patch of the Michelin tyres can even double. Normally they have a width of 310 mm. Four sorts of tyres can be used: slick tyres for dry conditions, and a hybrid tyre (no profile either but softer cover) for mixed conditions and wets and full wets for heavy or extreme rain. The full wet tyre manages to push up to 120 litres of water per second out of the way. 9.2 km of the 13.6 long circuit consist of what are normally public roads. All in all, there is even more than honour and glory to be won at Le Mans: twice as many points are awarded than in the other seven races for the FIA World Endurance Championship (WEC) that are each six hours long. In the WEC standings, the Porsche team with 53 points is currently second behind Audi (70) and ahead of Toyota (47) after two of the eight races. The Porsche 919 Hybrid was designed and built at the Development Centre of Porsche AG in Weissach. 230 team members work there. The core team from Porsche for the three LMP1 cars at the race circuit in Le Mans consists of 120 team members (engineers, mechanics, team management). Add to that personnel from communications and marketing, sponsoring and driver support. Up to 19 chefs are busy in the Team and Media Hospitality in the paddock, sometimes around the clock. Their shopping list includes: 4,700 eggs, 420 kg of pasta, 300 melons, 6,000 litres of mineral water and 2,000 loaves of bread. While most of the team members catch some sleep during the night of the race whenever they have time and space, the drivers have beds in containers located behind the pits. The organiser, the Automobile Club de l'Ouest (ACO), announced 263,300 spectators attended last year’s event. The trend is for this number to increase. The technical inspection of the 56 racing cars, which are subdivided into four classes, begins on the Sunday before the race, June 7, at the Place de la République. It is a public event in the middle of the city. The scrutineers examine the cars, and the 168 drivers must present their paperwork. The Porsche LMP1 team is scheduled for this inspection on Monday, June 8, between 1:30 pm and 2:20 pm. The last teams will complete this technical part of the administration by 6:00 pm on Monday. It is the Porsche's fastest research laboratory and the answer to the new WEC rules.